Who Are You? Nick Morley (aka Linocutboy). I am an artist and illustrator. 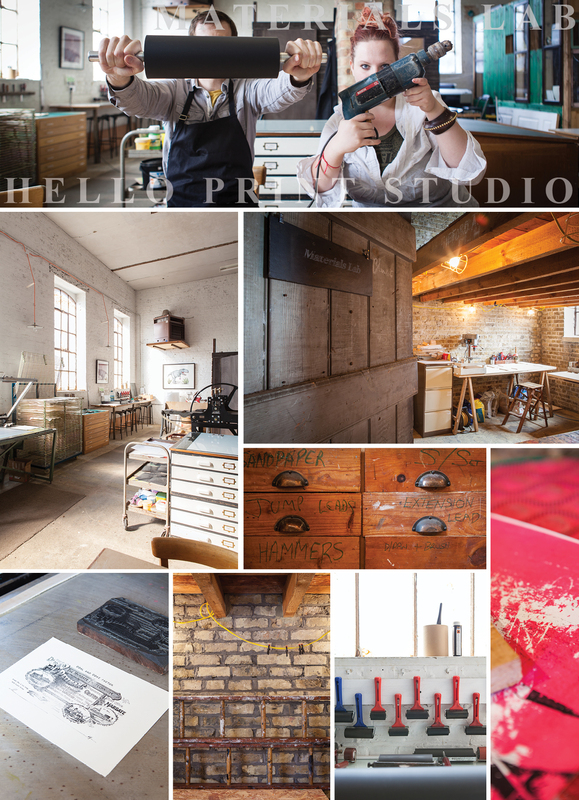 I run Hello Print Studio, an inspirational space for making prints at Resort. I’m Rachel – Sculptural Designer Maker working within public arts (Rachel Ella Design) and founder of the Materials Lab at Resort Studios. If you were an animal what would you be? Nick – I AM an animal. Rachel – A bee because I’m organized, sociable, hard working and would love to fly. What does RESORT mean to you? 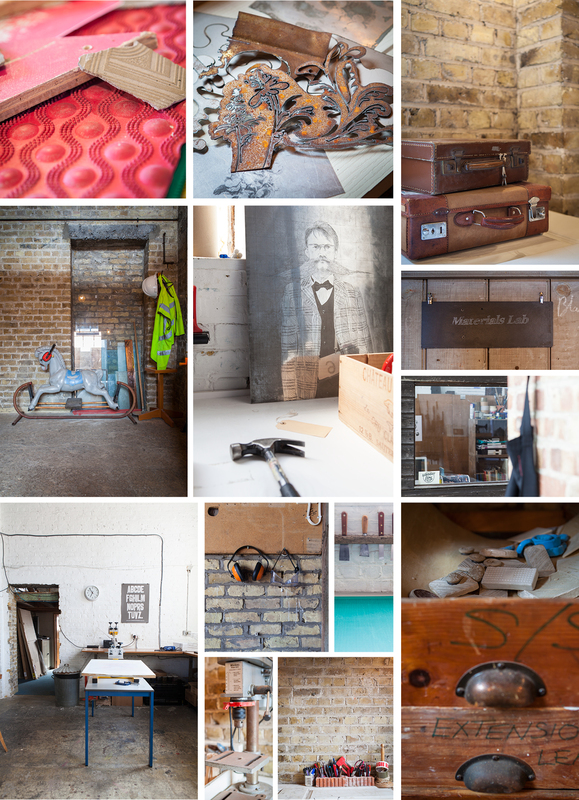 Nick – Community, creativity, friends, pushing boundaries, sharing ideas, resources, energy and coffee mugs. Rachel – Collective spirit- a meeting of minds; We have a shared work ethic, a focus on high quality work and vision for exploring interdisciplinary collaborations with a social conscience. We all pushed ourselves to the limit to set up the studios and I think the results speak for themselves! Learning, laughing and creating an identity together for resort that in essence is much bigger than just the studio. A fatalistic blend of kindred spirits to share my days and passion for great art with! It truly feels like family! Living the dream- This is the first time since university that I have shared a studio space, I longed for interaction and engaging conversation with other creative’s when I moved back to Kent, so being a part of resorts’ conception was exactly what I was seeking. Thoughts on Cliftonville? Nick – I have grown to love Cliftonville through spending time here. There are so many great shops and businesses, which have been here for years (sometimes hundreds of years). And the buildings are beautiful. Rachel – Cliftonville excites me, it is a melting pot of different cultures and most of my favourite places to socialize are there. It is the perfect location for my practice as social responsibility is at the heart of my public art projects and future plans for the Materials Lab. I very much hope to work on lots of genuinely engaging projects locally. Best thing about the Studios? Nick – The sunlight coming in through the huge windows in the early evening gives me a glowing feeling. Rachel – The people! I feel so lucky to have such an amazing eclectic group of creative’s to share this exciting venture with. From the day we met to discuss the idea of founding the studio I have been overwhelmed with excitement. Having the space and opportunity to make a mess and noise and run with big ideas is liberating. Collaborating to bring future endeavors to fruition with a strong support network from other studio members leads to an unparalleled creative environment. It really feels like the possibilities are endless! What would you change about the studio / building if you could? Nick – I would restore the beautiful stained glass in the shop front and the ornate lampposts in front. Rachel – I’d love to renovate the windows to bring more light into the space to make it an even more inspiring place to be and have a dedicated space to work on even larger scale projects. Who are your heroes and why? Nick – Jarvis Cocker. He’s effortlessly cool but still grounded. And endlessly inquisitive and interested in the world. Rachel – People who overcome adversity and battle through life to pursue their dreams and achieve them against all odds! Scientists, socially driven Designers, Firemen, Therapists, Philanthropists… anyone who dedicates their life to make the world a better place gets a badge of honor from me!! What inspires you? Nick – I love old prints, posters and photographs. I collect old books and magazines, mainly for their pictures and sometimes just for their covers. Rachel – Human endeavor, natural wonders, and Craftsmen/women’s commitment to spending a lifetime honing their craft. If you could collaborate with any artist /designer past or present who would it be? Nick – Albrecht Dürer would be pretty cool. As would Raymond Briggs. Rachel – Leonardo da Vinci– innovative & unafraid to try new ideas despite scepticism from peers. No limitations- He was a painter, sculptor, architect, musician, mathematician, engineer, inventor, anatomist, geologist, cartographer, botanist, & writer… imagine the potential for collaboration with someone so skilled! Describe a typical day in the materials lab / print studio. Nick – There is no typical day in the print studio. I might be working on an illustration, teaching a workshop or collaborating with another artist. Rachel – Getting messy mixing up concrete, photo shoots of work produced in house, experimenting with new material combinations & researching ideas for creative practitioners to collaborate with. Oh, & rummaging around at Scott’s, on the Internet & downstairs in the Pettman’s auction house for new bits of kit to play with! Tell us a little about the workshops on offer? Nick – We run regular workshops in etching, screen-printing & linocut as well as workshops with visiting artists. I’m especially looking forward to Umberto Giovannini’s woodcut workshop on 18/19 October. Umberto is Hello Print Studio’s first artist in residence. He is coming over from Italy to travel around Kent collecting stories & will then make a series of prints here. Rachel – As well as offering facilities & equipment to artists to create 3d works in the Materials Lab, I’m offering unusual workshops with collaborative materials & process combinations teaming up with other specialists. For example the Materials Lab & hello print studio are teaming up to offer a concrete casting lino block workshop this month on Saturday 12th October as part of the Pushing Prints festivities. I’ll be constantly building the workshops on offer to bring new & exciting processes to Margate- Keep an eye out for our exciting NEON LIGHT MAKING WORKSHOP COMING IN THE SPRING! Future Plans? Nick – To bring artists & designers from all over the world to work at Resort. Visit Pushing Print events from 5th to 20th October, at various venues around Margate.